KUALA LUMPUR: S P Setia Bhd, the country’s second largest property firm by market capitalisation, is the latest to be swept off the private property sector with the takeover offer by its parent Permodalan Nasional Bhd (PNB). It is the second transaction in the real estate industry related to PNB, after Sime Darby Bhd’s proposed acquisition of 30% stake in Penang-based Eastern & Oriental Bhd just last month. PNB owns 48.1% in Sime. Trading in S P Setia shares was suspended yesterday to facilitate the exercise, but the stock rallied nearly 13% or 40 sen to RM3.50 on heavy trading just the day before, ahead of the news. The exercise confirmed an exclusive front-page report in The Edge Financial Daily yesterday. In a notice yesterday, PNB extended a conditional takeover to acquire for cash all S P Setia shares at RM3.90 per share and warrants at 91 sen per unit. Meanwhile, in response, S P Setia said it will invite counter bids from other parties as it views the offer by PNB “fundamentally undervalues” the developer. “The board has met to consider the offer and is of the view, based on external valuations of the company by investment analysts published before receipt of the offer, that the offer fundamentally undervalues the company”, it said in a statement to Bursa Malaysia. “The board will also be writing to the offeror to enquire whether they are interested in revising the offer price upwards to reflect a price which is closer to the fair value of S P Setia,” it added. The company said the decisions were taken at an emergency board meeting convened yesterday with the unanimous vote of all board members present save for Tan Sri Wan Mohd Zahid Mohd Noordin who is an interested director. It said Wan Mohd Zahid and Datuk Noor Farida Mohd Ariffin, both deemed connected to the offeror, will abstain from deliberating and voting at all the relevant board meetings in relation to the offer. S P Setia plans to appoint an independent adviser in relation to the offer, and advised shareholders not to take any action until receipt of the independent advice circular. The offer is conditional upon PNB receiving more than 50% of the voting shares of S P Setia. It currently has a 33.17% stake in the property developer. It was launched after PNB and parties acting in concert acquired a total of 3.07 million shares from the open market on Tuesday at prices ranging from RM3.16 to RM3.50 per share. This raised their stake from 32.99% to 33.17%, triggering the general offer. The purchases accounted for 41% of that day’s trading volume of 7.4 million shares. PNB can easily achieve the threshold if the Employees Provident Fund, which controls a 13.42% stake and Kumpulan Wang Persaraan (KWAP) which holds 5%, accept the offer, as it would end up with 51.59%. This could also mean that PNB may not even need the nod of other shareholders, including that of Tan Sri Liew Kee Sin’s. Liew owns 11.26% of S P Setia. As at Aug 31, before the recent market sell-off, S P Setia had a foreign shareholding of 21%. With the exit of foreign investors and uncertainties over the company’s future leadership and management direction, analysts say many of them could be inclined to accept PNB’s offer. If the proposal goes through, this could effectively turn S P Setia, an epitome of successful entrepreneurial drive, to a government-linked entity. While PNB intends to keep S P Setia listed post-takeover, the big question remains: will Liew exit and will its management be revamped? Liew has declined to give a statement on the matter. A MIDF property analyst said this is a concern given S P Setia’s reputation today is owed to the current management of the company. “Investors’ decision (on whether to hold onto S P Setia shares) will very much depend on whether or not the management will be the current guys. “Because if you look at S P Setia’s current products like Setia Alam and its landbank; they need that kind of management to achieve such a reputation that was built over years and years,” he said. Affin Investment Bank property analyst Isaac Chow said although the offer price translates into a marginal premium to S P Setia’s estimated real net asset value of RM4, it can present a good opportunity for investors to cash out against a dismal market outlook. “We are just curious on the future plans and direction of the company,” he added. The proposal follows PNB and parties-in-concert’s acquisition. The offer price is at a premium of 11.4% to S P Setia’s closing price of RM3.50 on Tuesday, a 21% premium to the five-day volume weighted average price (VWAP) and a 15% premium to the one-month VWAP of S P Setia shares. The offer price for the warrants translates into a premium of about 98% to Tuesday’s closing price and 116% to the five-day VWAP. With net assets per share of RM1.81 as at July 31, the RM3.90 offer translates to a price-to-book ratio of 2.15 times. For the nine months to July 31, S P Setia chalked up net profit of RM245.5 million, or 14.6 sen per share, on the back of RM1.6 billion in revenue. PNB is no stranger to the real estate scene given its holdings in both listed and unlisted entities. 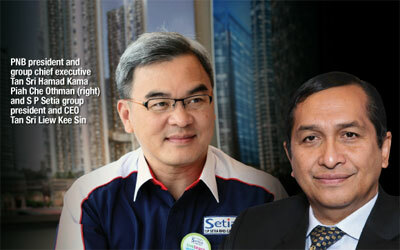 S P Setia is possibly its biggest investment in the sector so far. The few PNB listed property firms that have been de-listed include Island & Peninsular Bhd, Austral Enterprises Bhd and Pelangi Bhd. In the event PNB plans to consolidate its property firms, including S P Setia, the merged entity can possibly become the country’s largest property group by market capitalisation. S P Setia will be the latest to join the foray of acquisitions led by the government-linked companies in private property sector. Last year, government-linked UEM Land Bhd acquired Sunrise Bhd to create the country’s largest property development company by market capitalisation. By comparison, Sunrise, which was acquired at RM2.80 plus a 20 sen dividend to shareholders, was priced at 1.32 times its net assets per share of RM2.28 as at Sept 30, 2010, before the takeover was announced. Permodalan Nasional Bhd’s (PNB) proposed takeover of S P Setia Bhd has raised eyebrows and potentially marks the ebb of entrepreneurial-driven property firms. S P Setia has come a long way since its founding in 1974 and it was not always smooth sailing for its captain Tan Sri Liew Kee Sin. Leong still the majority owner of Mah Sing with a 35.2% stake. Liew received flak when the company bought a large 3,900-acre (1,560ha) track of land in Shah Alam, bordering Klang, from See Hoy Chan Group in 2002. However, he proved sceptics wrong when he turned that land into two award-winning townships — Setia Eco Park and Setia Alam. Liew had instantly turned the brand into priceless goodwill. In the process, he also lifted prices of neighbouring townships in Klang. S P Setia helped spurt the NKVE-Setia Alam Link, which was followed by many more highway linkages, and scores of developers that have followed suit with planned community living concepts. For these and many other reasons, Liew is viewed not only as a prolific business figure, but an important contributor to the real estate community. Now the table has turned on Liew, who was apparently caught off guard with PNB’s takeover move. With the proposed takeover of S P Setia by PNB, it is uncertain whether Liew will be given a free hand to run the company. The fund manager added the takeover by PNB is not entirely a surprise given that the fund has been accumulating and holding the shares for a few years now. He also noted that Liew made himself vulnerable to a buyout when he sold down his shareholding to the 11.26% level currently. Indeed, the collective shareholding of government-linked and provident funds came up to about 47% prior to the takeover offer, but perhaps no one then batted an eyelid largely because the shareholdings were very fragmented. PNB now needs to meet an acceptance level of 50% to push through its takeover proposal, and this could be achieved effortlessly if the Employees Provident Fund (EPF), which controls a 13.42% stake, and Kumpulan Wang Persaraan which holds another 5% accept the offer. It is interesting to note in the event PNB consolidates its property firms, including S P Setia, the merged entity can possibly become the country’s largest property group by market capitalisation. But in this case, bigger doesn’t always mean better, especially if S P Setia is run as a typical inhibited, bureaucratic and lowly empowered government-linked company. This is the reason why some quarters are against the government’s takeover of entrepreneurial-driven firms like S P Setia. While the government is seen as becoming a dominant player in the private property sector, it is also privatising its own parcels of land in strategic areas. This include a 62.5-acre prime land in Mont’Kiara, which its swapped with the controversial RM628 million trade centre, the 495-acre Sungai Besi land and the 3,300-acre Rubber Research Institute land in Sungai Buloh. That said, it is puzzling to see the government releasing more of its land to the private sector, just to see it taking over these companies that would benefit from the projects. In Hong Kong or Singapore, the government’s role in property sector is to ensure steady release of land to avoid excessive speculation and ensure the availability of affordable housing for its citizens. However, the government’s objective in buying into private developers here is unclear. Some are of the view that the government here could be functioning as a ‘last resort’ buyer, especially since there has been little foreign merger and acquisition (M&A) interest in the local property sector. There are those who argue that it is the attractive valuations of property firms here that make them a target for local funds who want to enhance returns. Given that most of the private developers now have a major government-related shareholder, some speculate that government-linked companies (GLC) or funds have yet to hit the brakes on its acquisition drive just yet. At Mah Sing Group Bhd, for instance, Koperasi Permodalan Felda Malaysia Bhd, PNB, EPF, Kumpulan Wang Persaraan and Valuecap Sdn Bhd collectively own a 20.8% stake. However, it may be a difficult task to take over Mah Sing, which raised its profile after it landed the priced Pekeliling land rejuvenation project, as its managing director Tan Sri Leong Hoy Kum is still the majority owner with a 35.2% stake. Another potential M&A target is IJM Land Bhd, owned by IJM Corp Bhd, which also has a large government-linked shareholder. This especially after the merger with Malaysian Resources Corporation Bhd (MRCB) fell through last year. It was speculated that it failed because neither could decide on who will lead the merged entity. In fact, part of the rationale for MRCB-IJM Land merger was to give the merged entity an edge in developing the Rubber Research Institute land. Late last year also saw the takeover of Sunrise Bhd by UEM Land Holdings Bhd, controlled by Khazanah Nasional Bhd. Sunrise was helmed by Datuk Tong Kooi Ong. While there are many questions left unanswered in the government’s ultimate property game plan, it certainly looks like entrepreneurial-driven property firms here are on the wane.